More and more people are coming out and sharing their personal experiences with dealing with autism. In jumpstarting efforts to solve this insidious problem affecting millions of families the world over, Autism Society Philippines shows a great away to raise awareness about the autism. My son Israel, who is now twenty-six years old, was born with this condition. Rearing him has not been a simple task. But, then again, I doubt that any parent could ever claim that raising child is an easy task – with or without autism. I, as his mother, have dealt with challenges other parents probably did not have to deal with. But, just the same, those other parents have had to face problems I did not have to face in raising my son. Having ASD does not define my son. If anything, ASD defines the amount and kind of care, attention and supervision that a parent has to take in nurturing their child. But what defines a person with ASD, as well as his or her family, is the kind of person he has become over and above autism. The worst that could happen is that our children and our loved ones would be deprived of the opportunity to reach their full potentials – and this is exactly what would happen if we remain silent and allow ASD to take over our lives. From this day forward, we must take the reign and assume a proactive role. Change must come soon. People on the autism spectrum are entitled to human rights, and nations of the world have a moral obligation, backed by international law, to protect and deliver on those human rights. The lack of adequate health care, the disarray of education and service options, the almost complete absence of employment options, and the scattered, often non-existent, supply of services and supports for the estimated 15 million humans with autism highlight that these rights are violated daily in countries everywhere. We hope that this event proves to be a harbinger of better things to come for our loved ones. All we hope for is for them to enjoy the best life possible. Atty. 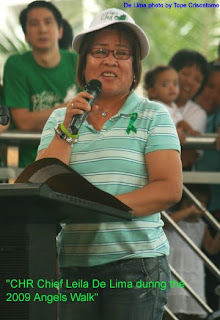 Leila M. De Lima, is the Chairperson of the Commission on Human Rights. Find out why she is a true and fearless human rights defender at the Autism Beyond Borders Conference at the 11th National Conference and 1st Southeast Asian Conference on Autism. Join us on October 24 and 25, 2009, at the SMX Convention Center, SM Mall of Asia.